These days, I’m out of my element when I spend time in big cities. Growing up just outside Washington, D.C., I spent lots of time around tall buildings, commuter traffic, riding the Metro, driving on the Beltway and among bustling humans rushing to and fro. Now, when I have the opportunity to spend time where pavement overrides grass, it’s actually a novelty, and I enjoy walking around and photographing the buildings, people and other aspects of civilization that I once knew so well. This building in downtown Indianapolis caught my eye last weekend, and it just happens to fit in perfectly with Cee’s Fun Photo Challenge this week. 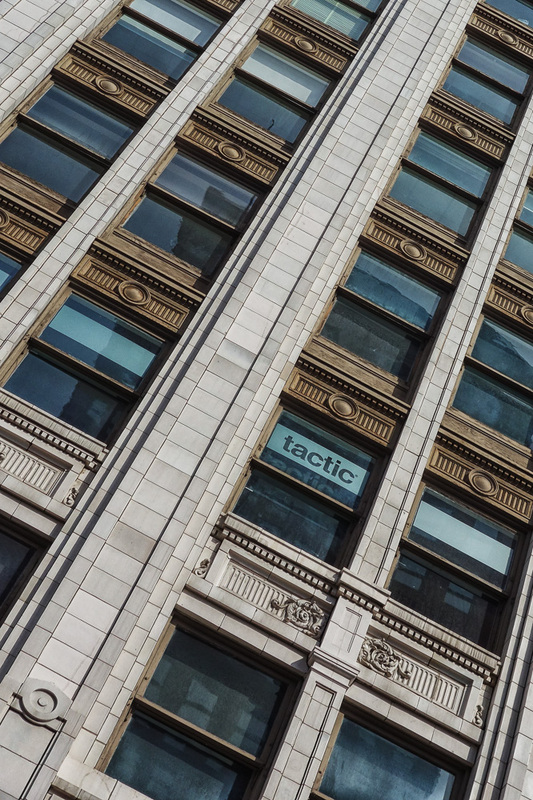 I loved how the word tactic was displayed to advertise this business, and the symmetry of it all was quite a treat for a wandering photographer. Excellent. Makes me dizzy in a good way! Thanks, Cee! I’m enjoying your fun challenges!